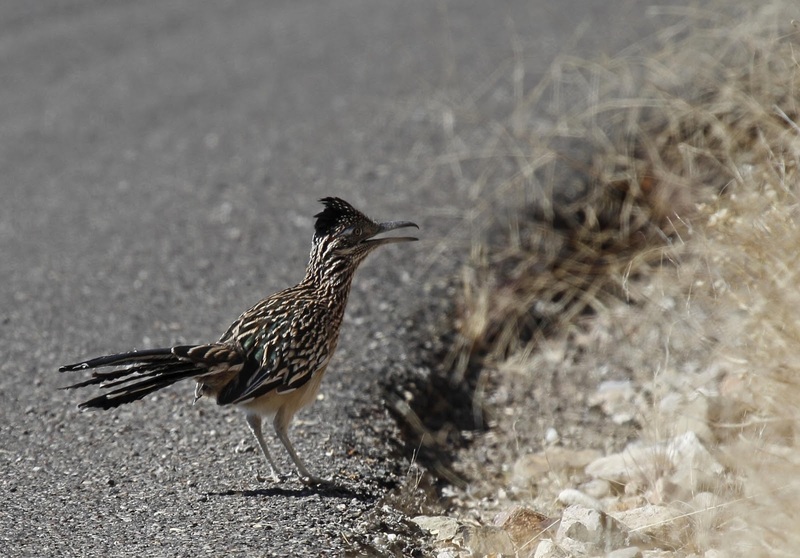 In case you were wondering if we saw Roadrunners, the iconic desert bird, the answer is yes. We went for half the trip without seeing one. Then, I hit pay dirt on the road to Madera Canyon and again at the Visitor Center to Saguaro National Park. No photo at all from Madera and only this half decent shot at Saguaro. 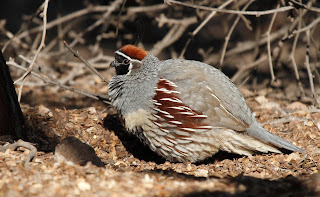 But then, we were treated to this fine specimen at the Desert Botanical Gardens! He sat there for a few minutes before running off. 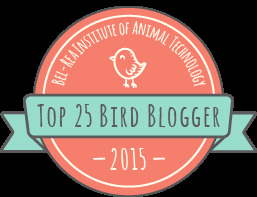 They are pretty big birds. That is a dead Saguaro cactus that he is standing on. The insides look like slatted fences. 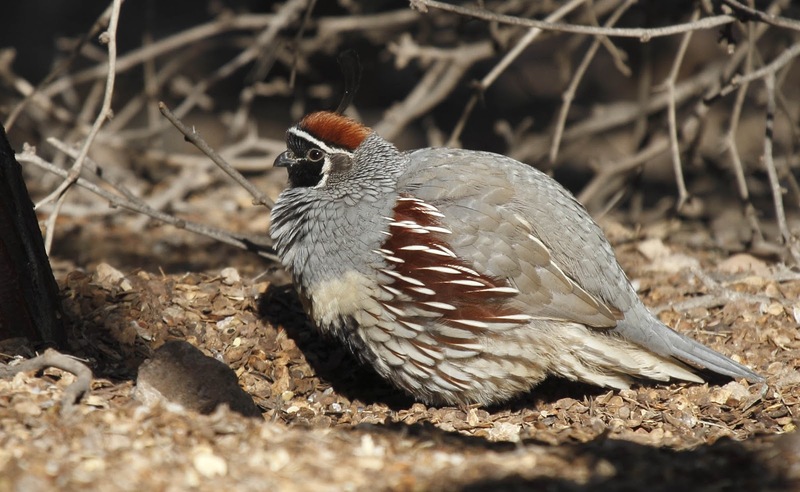 The other bird that is ubiquitos in the desert are Gambel's Quail. 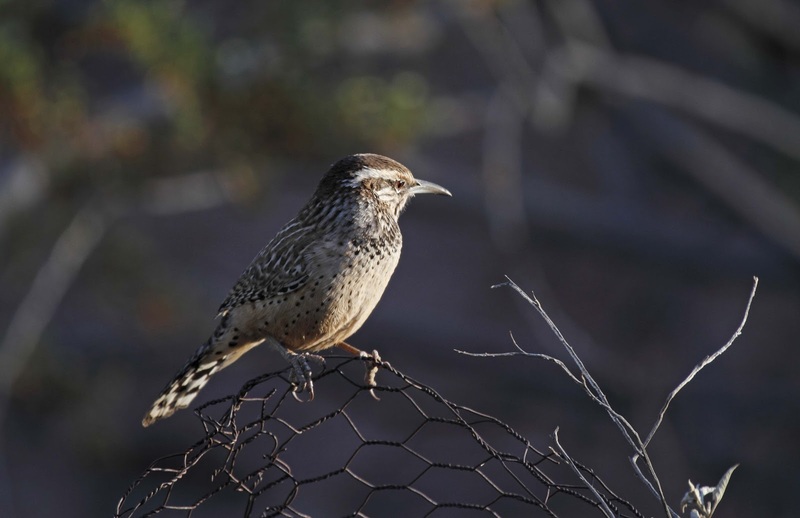 We heard and saw these little gems at every stop in Arizona. They are mostly shy and run away from you. 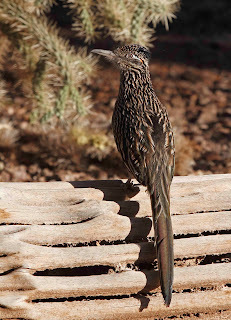 But in the botanical garden, they are quite tame. They are so tame in fact, that they came running out into the concession area looking for handouts. 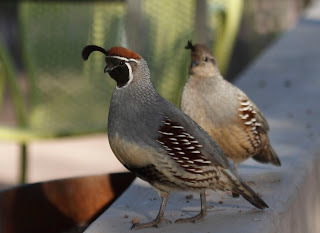 We know that we are not supposed to feed the wildlife, but . . . we really couldn't help ourselves. The concession stand was closed and we were sitting there for a break and well, you know, they were really cute. Click on the video below. 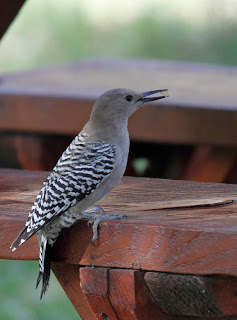 This Gila Woodpecker grabbed a crumb from under the picnic table at The Farm at South Mountain which is a cool place with 3 different restaurants. We had lunch and watched the birds. Grackles also looked for leftovers at the picnic area. 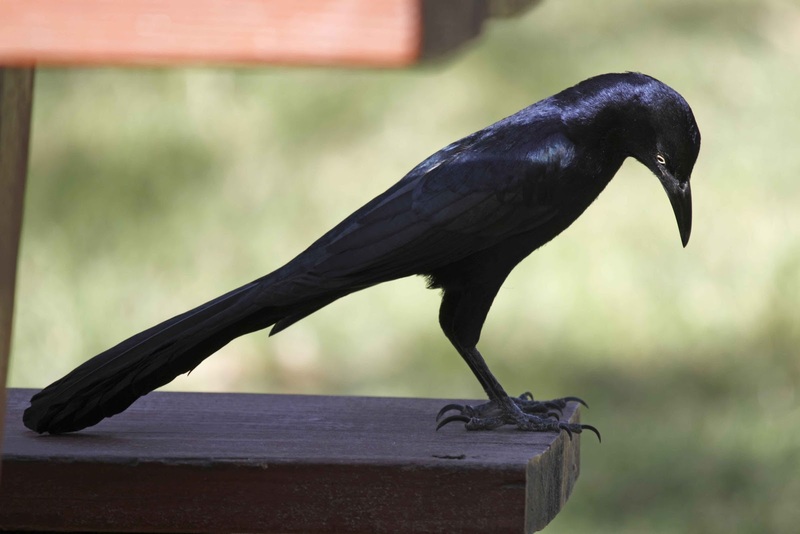 This grackle is called Great-tailed for obvious reasons. This mystery blackbird was mixing it up with the Grackles. 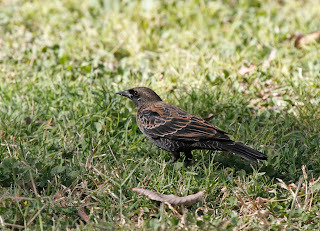 I think it is a weird Red-winged Blackbird but would love someone else's opinion. 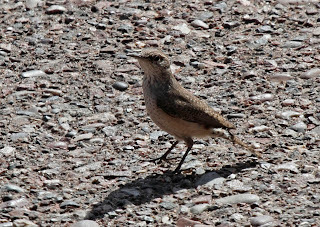 This is a terrible photo of Rock Wren. You can see from the shadow that it was high noon with really harsh, bright light. 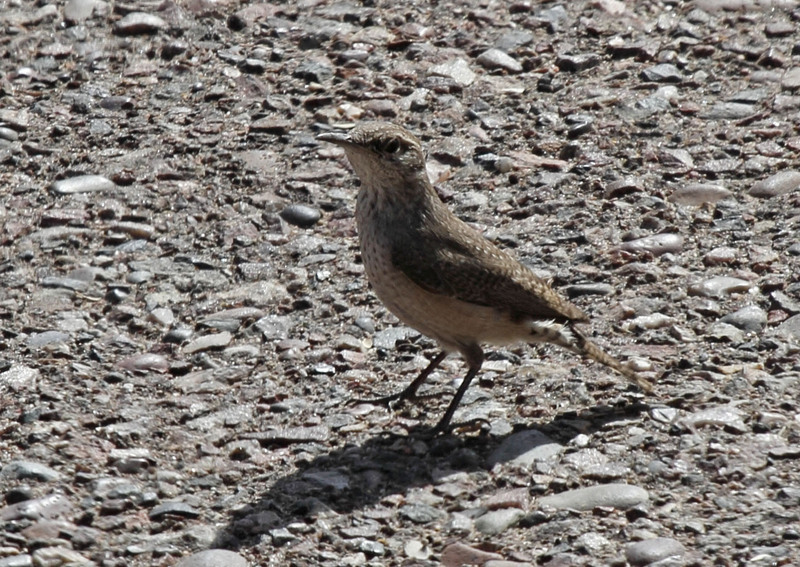 The bird popped around the parking lot for a bit and I just had to photograph it. As you may be able to tell by now. I have ALOT of photos from the trip. There are more that I won't bore you with here. Suffice it to say that Arizona is a good place to be with plenty of time on your hands and a camera. Iconic? Ubiquitous? I'm impressed! Oh, great photos, too. HA. I had the dictionary beside me when writing that last post. Pretty haughty stuff huh?